The Arkansas Archeological Society participates in an annual outreach event called Arkansas Archeology Month. Held in March each year, Archeology Month is designed to broaden the public’s interest and appreciation for Arkansas’s archeological resources and to encourage the public’s participation in conservation and preservation efforts. Archeology Month is co-sponsored by the Arkansas Archeological Society and the Arkansas Archeological Survey and is made possible through the efforts of supporters throughout the state at parks, libraries, museums, and other agencies and organizations. 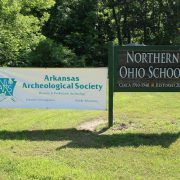 Each Society Chapter is expected to sponsor events to introduce the public to the archeological resources of Arkansas. 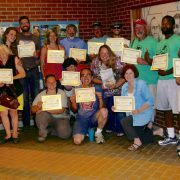 Archeology Month events and activities include exhibits, tours, workshops, slide-talks, open houses, archeological excavations, and other special events. A Schedule of Events is published each year to advertise the various activities, and a special poster is often produced to commemorate the event. The event began as Arkansas Archeology Week in 1991, and expanded to a month-long format in 2002. To view more information on past Archeology Month activities click here.